Located in a family friendly quite neighborhood. We invite you to fly away and be at home with us. You will get a full two-story home to yourselves. With four bedrooms, two bathrooms, full kitchen with breakfast. We have WiFi, cable TV, Netflix, BBQ and your own private back yard and deck. 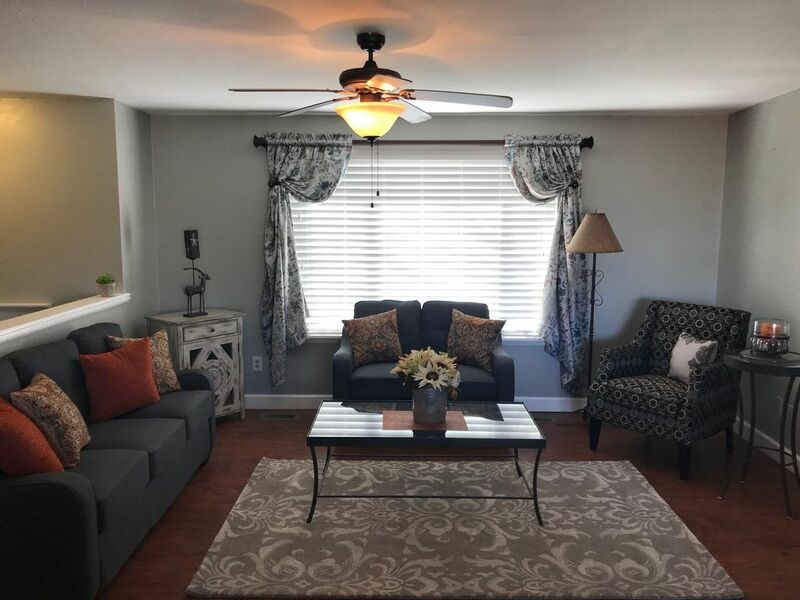 We also have a washer and driver We hope our warm, welcoming ambiance will help your stay in Utah and Salt Lake Valley to be relaxing and enjoyable. We traveled ourselves and made notes of what we enjoyed and what we missed when staying in Airbnbs and gave attention to detail to make your stay as comfortable as possible. Everyone is welcome. Being raised in Europe my family and I enjoy diversity and people from all different parts of life. Our beautiful home can sleep up to 12 people. If needed we do also have an Air Mattress which can easily bring that number up to 14 people. We have nice back yard with big patio and a fire pit. The home has a lot of open space for family and friends together around. We also stock the Keurig Coffee and breakfast for your 1st day. That way you do not have to run out and get food right away. We are great for family reunions and get together's . The home is located in a quite neighborhood. Jordan Landing shopping Center that offers chances of restaurants, shops and variety of stores, also large movie theaters are no more than 5 min. away. The Salt Lake Valley and the State of Utah offer a variety of activities such as winter sports. Seven different ski resorts, mountain climbing, hiking and biking in some of the most beautiful unique scenery. Lake Powell is stunningly beautiful and five national parks are here to explore. Salt Lake City offers Temple Square, historical monuments, gardens, parks, zoo, shopping and a variety of entertainment choices. Bangertier Highway is accessable in about five min. ; giving you access to all the major freeways, entrances and exits in all directions; and giving you direct access to the airport. Public transportation is available in your neighborhood. You can catch the bus by walking five to ten minutes to the bus stop. We are located 10 minutes away from the Olympic oval where sporting events and programs, ice skating, you can even learn to curl. I am Gunhild Jones was raised in Germany and France. I have raised my family in this valley. We love the beauty and diversity in Utah. We have six children (all grown up, thank goodness). Our family participates in all activities and sports that this valley has to offer, such as hiking, boating, golf, skiing, snowboarding and zip-lining. We understand family and being active and try to make the best out of life. My friends call me Gundi ;). It is an appealing, quite neighborhood with close access to major highways and freeways. Shopping center, grocery store are located in walking distance. Bus stop within in walking distance in neighborhood. Recently remodeled home, clean and comfortable, perfect for families, small groups, couples and singles. Complementary pantry items. Large deck for outdoor relaxing or dining. Hosts is in close proximity for contact. Short travel distance to attractions, shopping and downtown Salt Lake City. The home can sleep up to 12 people. If needed we do also have an Air Mattress which can easily bring that number up to 14 people. We have a private back for you to use with a fire pit and BBQ. We also stock the Keurig Coffee and breakfast for your 1st day. That way you do not have to run out and get food right away. We have cable TV and Netflix along with a DVD players. We also have a washer and driver and full size kitchen. Two full bathrooms. We are great for family reunions and get together's . Both bathrooms are beautifully tiled. Easy access to bedrooms. The Salt Lake Valley is surrounded by Wasatch Mountain range. Beautiful can be seen thru out the valley. Coffee pods, hot chocolate and teas. Spices, salt and pepper, flour, sugar, soups. crackers, cereals and other complementary food items. Beautiful dining set with six chairs. Keurig coffee maker, complementary coffee pods available, toaster, electric kettle. Cooking and baking ware, cooking utensils and complete dining ware. Dining area located close to sliding doors that lead outside to a large deck. Information on attractions in Salt Lake City and surrounding area is available. The home is located in a typical neighborhood with fenced in backyard. Neighborhood has neighborhood watch patrol and a neighborhood park. Five minutes walking distance to the grocery store and five minutes drive to major shopping center. We were a few friends that stayed here for a ski trip. We had a wonderful experience! Our arrival flight was delayed and we only got to the house close to 1 AM. Gundi met us there at that time to give us a tour of the house. At that point we discovered the pantry and refrigerator was fully stocked with food for us to use! Apart from the food, the house is beautifully decorated, everything is new and comfortable. It is perfect place to stay for a getaway to SLC. Gundi is the perfect host and went out of her way to make sure we are comfortable and have everything we need. We absolutely recommend staying here and will definitely go back for our next trip. Thank you Gundi for making our stay special! You have been a pleasure to have . The property is spacious, very comfortable, clean, and convenient to dining, shopping, and skiing. Gundy and her son Jeromy are EXCEPTIONAL landlords. When we arrived they met us, gave a tour, and explained house operations. At that point we discovered a fully stocked refrigerator and cupboard. When we needed a room humidifier a brand new one appeared. Our ski group agreed we will stay here during our next ski trip if the property is available. We loved this property, the host is sincerely generous and went above and beyond all of my vrbo experiences with providing a clean , functional and updated house. The space is perfect for families that need space, the kitchen is well suited to stay in for a meal and the location is perfect to get around town or up the cottonwood canyons. We loved having you guys. Please come anytime. Please let us know if we can do anything else for you. Our party with 7 adults and 2 children enjoyed our stay here. Home was clean and the beds were comfortable. The fridge and pantry were generously stocked by the host. Shopping, restaurants, and movie theaters within half a mile. There are Vasa Gym, 24 Hour Gym , neighborhood park about 4 min. away. Bus stop is available in 5 min. walk by foot. There are theme parks, children's museum, dinosaur museum, natural history museum, "This is the Place" - Pioneer Village, pioneer history museum, art museum, opera, theater, symphony, events.